But what will happen, if you'll make the train to choose between one-way and two-way signals? Correct connection should be previewed first. When both the signals are one-way signals the train chooses the eastern route. When the eastern route begins with one-way signal, the train always chooses the eastern route (Picture 1), even when two-way signal at the entrance of western route is green. 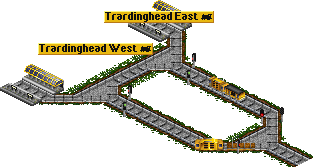 But when the eastern route begins with two-way signal, the train checks it and chooses the western route, regardless of it's state (Pictures 2 and 3). When the shortest route begins with one-way signal, situation is just the same. The train doesn't check other ways (Picture 4). When the shortest route begins with two-way signal, the train chooses the free route, even if it's longer (Picture 5) or busy (Picture 6). In case, when shortest route is free and longer route is busy, the train always chooses the shortest route (Pictures 7, 8, 9 and 10). In this case, all depends on the signal on shortest route. When it's a one-way signal (Picture 11), the train always chooses it. When not, train looks for other routes, even when there are none (Picture 12). When the correct route begins with two-way signal, the train chooses it when it free and goes by when it's busy (Picture 13). When the correct route begins with one-way signal, the train chooses the correct route (Picture 14). As you can see, a one-way signal at the entrance of the wrong route (Picture 13) doesn't protect train from choosing it. Train changes the destination point to the nearest depot when service interval passes. It can be fixed with TTDPatch 1.9 by adding depots to train's orders list. The train will never go to depot until it becomes its destination point. Train looks only 65 squares ahead. If it can't find a route in 65 squares, it selects the nearest point and can make a mistake. Use CheckPoints to help trains to find a right way. Using two-way signals. As you could see at the Picture 13, in some cases it leads trains to wrong route. Be careful using two-way signals.